There was a nice is somewhat shortlived display of the aurora borealis (northern lights) over Ireland tonight. I was unable to get out with the camera during the peak of the display, but did get out along the Boyne just in time to capture the aurora before it faded from view. 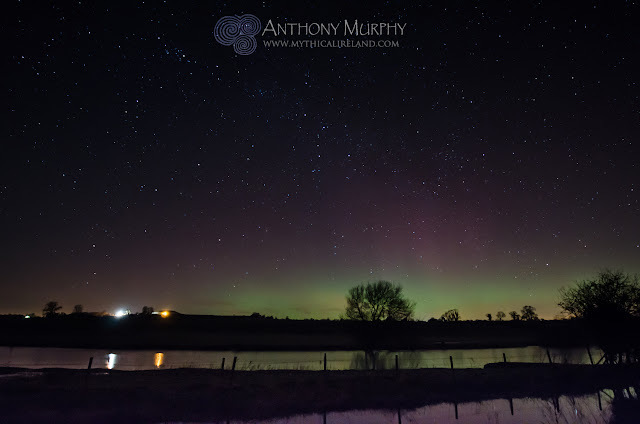 This is the best of my shots, showing the greenish aurora to the right of Newgrange, with the Boyne river and (close foreground) the Boyne canal also in the view. The W-shaped constellation Cassiopeia is in the centre of the view, with Aries and Triangulum about to set over Newgrange. High up to the left is Perseus. Of course these constellations had very different names in ancient Ireland.